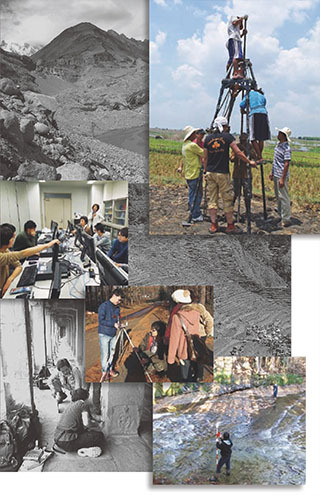 The educational and research programs in the Department of Geography aim to explore the relationship between the physical environment and human beings. The graduate program of geography is the only program belonging to a graduate school of science and technology within the private universities of Japan. The program offers graduate students a variety of practices, experiments and field surveys on human activities as well as on the physical environment. The Department of Geography was founded in 1926 in order to educate geography teachers for high school and junior high school. The Graduate program of Geography was established in 1963 with a Master’s degree course and then in 1965 with a Doctoral degree to educate basic and intensive research to explore new frontiers in geography. The Geography program consists of the following fields: physical geography exploring physical environment, economic and social geography studying human activities and social groups, regional geography synthesizing physical and human dimensions on region, and geographic information science including GIS, spatial analysis, and remote sensing. Lectures, practices and experiments are held mainly at the campus of College of Humanities and Sciences in Setagaya, Tokyo.